You can snooze a conversation if you want to deal with it later. If you snooze a conversation, it will be archived and will return to your inbox at the exact time and date you want. 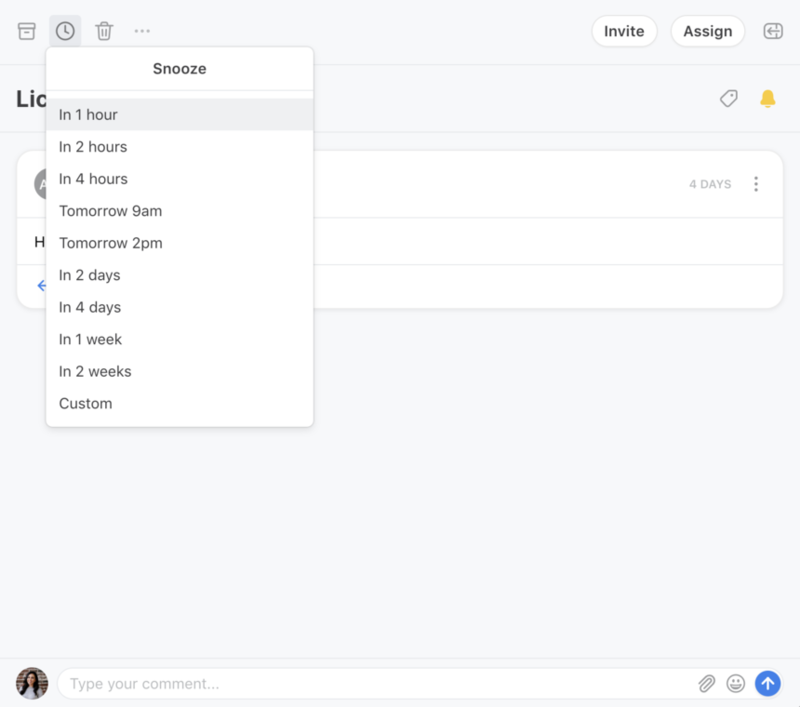 If you snooze from a shared inbox, you will snooze the message for your teammates, but if you snooze from your personal inbox, you will only snooze the conversation for yourself. To snooze a conversation, click the snooze button with an alarm clock icon in the top toolbar. Use the Custom option to choose a specific date and time not on the list. The conversation will reappear sooner if someone else sends a message in that thread. Reminders are useful to schedule follow-ups for your outgoing messages. Click the clock icon at the bottom of the message in your composer to get reminded of the message at a later time. 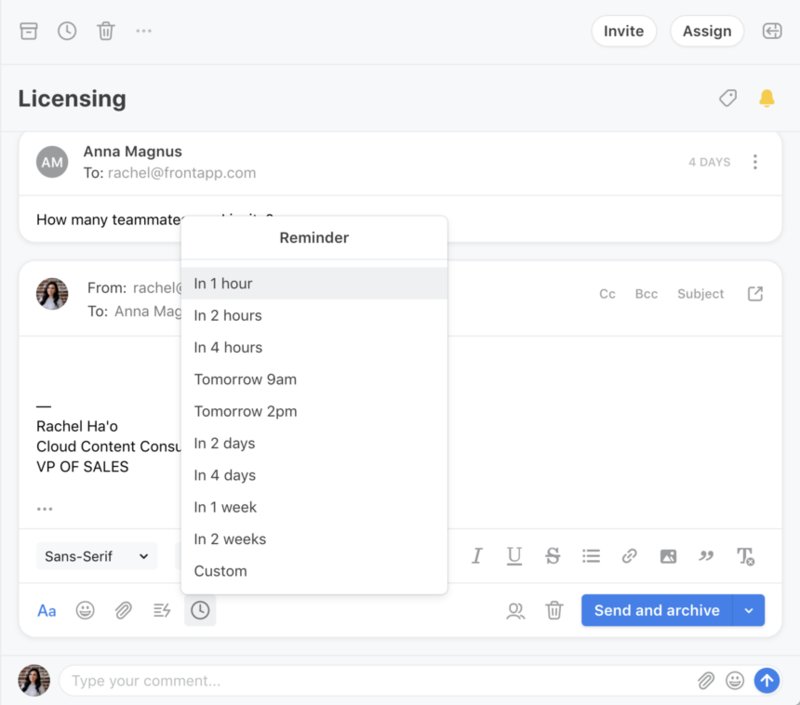 If you select a reminder in 2 days and click Send and archive, the conversation will return to your inbox if your recipient has not replied after 2 days. 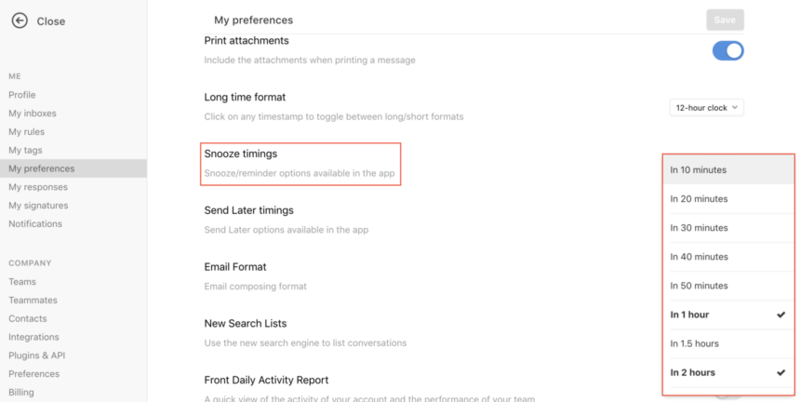 You can curate the list of options that show in your snooze and reminder menus by going to your Settings, and clicking My Preferences. Find the Snooze timings option and select your times here. It would be great to have an option that would keep the conversation open when a reminder is set. Malcolm Felt If you set the reminder and click Send (instead of Send & Archive), then the conversation should remain open. Cori Morris Yes, that should work for us anytime we send a reply to the customer. We also call customers and would like to use snooze button in the top message bar to set a reminder to call the customer again. For those reminders, it would be great to have the message stay open. Thanks again. Malcolm Felt I will share this feedback with the team, however, the purpose of the snooze feature is to remove it from your list until you're ready to deal with it. Would be great if we could set reminders after we've sent an email... because we could have forgotten to set the reminder before sending it off. You can snooze the email after you've sent it. Just click the clock up top. Is it possible to set a "sticky" reminder, i.e. a reminder that stays attached to a conversation even if the client replies? Today I emailed a client and set a reminder and got on with my work. The client replied with a quick "Thank you" email, and then I had to set the reminder again. Annoying at best, embarrassing at worst if had forgotten to re-set the reminder (or snooze it). Thomas Johnston Currently there's no way to do this, but we do hope to have this feature in the future. Suggestion: Add a 'Next Monday at 9am' option similar to the 'Tomorrow at 9am' option. I suspect that like me, people often do that manually for things they want to start fresh on next week. John Fabrega thanks for this suggestion, feel free to send our support team suggestions using our contact us page, thanks! I've went ahead and logged this with out team for you.